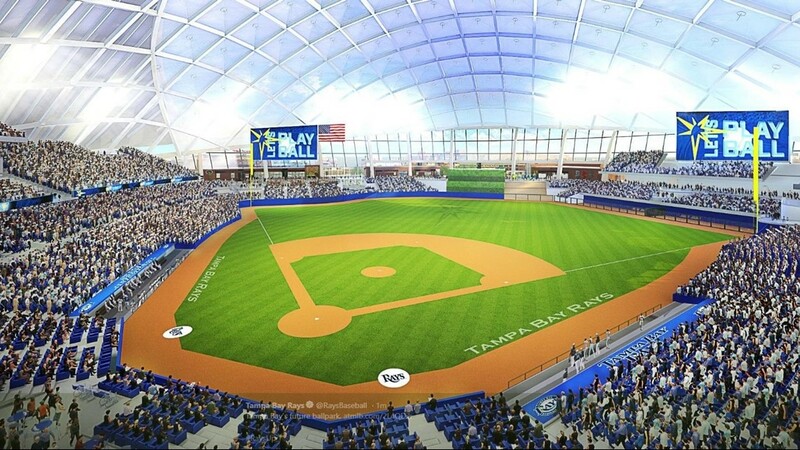 Tampa Bay Rays' $892 million stadium in Ybor City: 1st photos released. Now, who pays for it? The first photos of a proposed Tampa Bay Rays stadium in Ybor City have been unveiled but if it were to become a reality, who would pay for it? 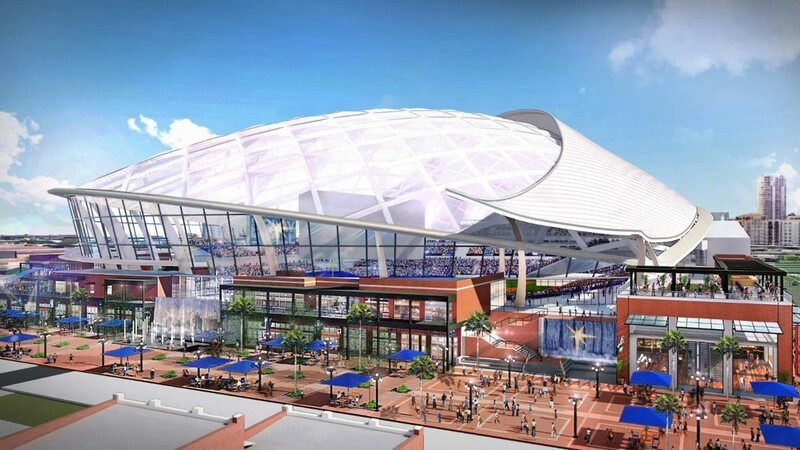 TAMPA, Fla. -- The Tampa Bay Rays have unveiled artist renderings for their proposed new $809 million stadium in Ybor City. And, another $83 million in what they called "necessary infrastructure" too, bringing the grand total to $892 million. But the biggest question remains: how will the proposed park be financed? Tuesday afternoon's press conference at Ybor City's Italian Club was aimed to build hype and excitement beyond the urban core. The Rays have been campaigning for a new stadium for more than a decade and have repeatedly suggested they couldn't afford to build it on their own. New details of the proposed ballpark include a total capacity of 30,842 - the smallest in the majors. It would have a fixed, translucent roof and synthetic turf. But the glass outfield wall would slide open completely. "This is not a stadium. This is a ballpark," Rays' Sr. Vice President Melanie Lenz said. But Rays owner Stu Sternberg said Tuesday he wasn't sure if the $892 million price tag was realistic. The city of Tampa has been dealing with tight budgets since the Great Recession and Hillsborough County has only limited funds while it pays down debt for the next few decades on three other stadiums: Raymond James Stadium, Steinbrenner Field and Amalie Arena. 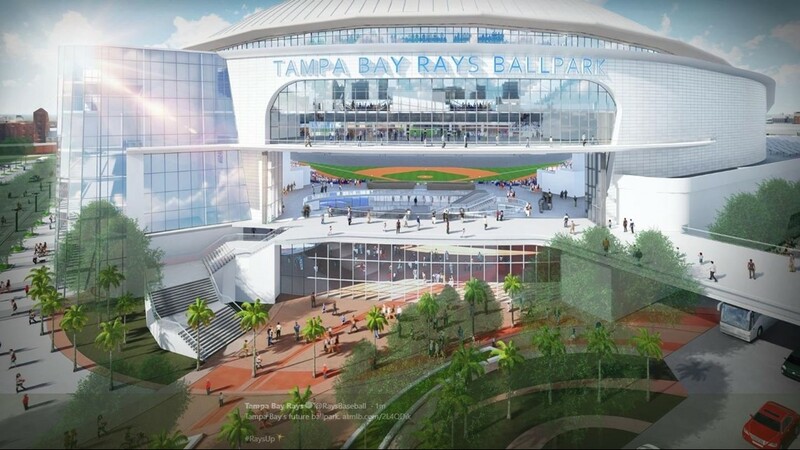 Despite claims that they'd studied everything about a new ballpark, the Rays still have not made any public comments about a financial commitment toward a stadium in Tampa, other than suggestions they would not fund the majority of the bill. Elected leaders have promised there won't be another "sweetheart deal" like the 100-percent subsidized stadium the Tampa Bay Buccaneers got in 1996, but 10Investigates has shown how the possible subsidies on a new Rays stadium could soar far past the $168 million Hillsborough residents paid for their football stadium (est. $250 million, adjusted for inflation). But for the Rays to move to Tampa, they'd need a pretty sweet deal. All they have to do to collect tens - potentially hundreds - of millions of free dollars from St. Petersburg to stay at Tropicana Field while the city redevelops part of the stadium's vacant parking lot. Much hope has been placed on corporate/private-sector fundraising, but it has reportedly been slow. Meanwhile, available tax dollars are few and far between. "It's a lot of money," Tampa Mayor Bob Buckhorn told 10Investigates Tuesday. "We've always known it was going to be a lot. I'm doing my best to try to get there, but I'm also willing to walk away if it doesn't make sense...we don't want to enter into a bad deal that's going to burden my kids' generation." Commissioner Ken Hagan, Hillsborough County's lead stadium negotiator, has refused to answer 10Investigates' questions about what kind of taxpayer costs are being discussed behind-closed-doors and on multiple occasions, has tried to flee 10Investigates' cameras at public events. He was a no-show at Tuesday's unveiling. 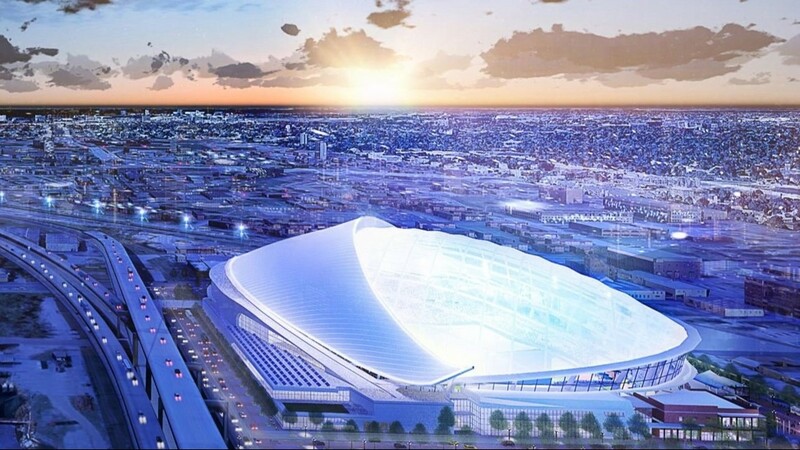 The Rays say they came up with the proposed design after conducting 39 focus groups, reviewing 8,000 submitted ideas and doing 21 one-on-one interviews. The new ballpark would include meeting spaces and open concourses that would be open to the community. Consultants say transit options in Ybor City include a trolley, Amtrak and future high-speed rail. There are only 4,400 parking spaces within a 5-minute walk, including a future garage development next to the stadium. But, the Rays say there are another 10,000 spots within 10 minutes -- mostly toward downtown. And ride-sharing, the team says, will greatly diminish the need for parking in the future. #Rays Sr. VP Melanie Lenz on proposed new Ybor stadium: 61% of summer nighttime games are impacted by rain and lightning; 45% of daytime games. A/C is a necessity. "Our trajectory is such that this would be an added benefit, but...we're going to be fine with or without it."